Usually too busy laughing uncontrollably and drooling out oil to look where he's shooting. Loves the sound of his guns blasting away. Wild and unpredictable. 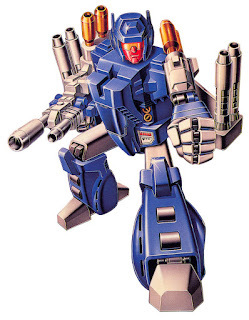 Paired with Blowpipe, a powerful compressed-air cannon who is also the conniving, envious brother-in-law of Lord Zarak, the Nebulan leader of the Decepticon Headmasters. In jet Mode, has side-mounted, rapid-fire photon-pulse guns. Maximum speed: 1,980 mph.